Hand analysis: Mo Nuwwarah triple-barrels with king-high in a bounty NL event from the WSOP Circuit. To barrel or not to barrel? Consider how you'd play this tournament hand near the money bubble. 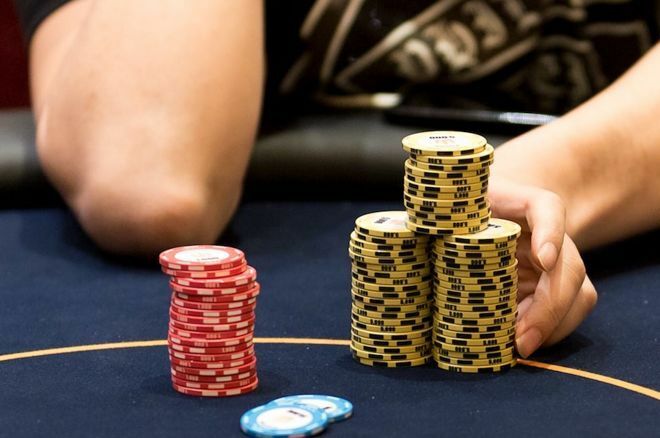 Covering live poker tournaments for a living affords me the opportunity to see countless thousands of hands played out, many of which offer interesting and potentially valuable insights into how players — both amateurs and professionals — play the game. In this ongoing series, I'll highlight hands I've seen at the tournaments I've covered and see if we can glean anything useful from them. It's been quite a long summer covering the 2018 World Series of Poker for me. My sixth summer covering poker's biggest event saw me put in a sick number of hours as usual, and of course involved the suspension of my weekly hand reviews. We'll try to dust it off this week and get back into a rhythm. Today I want to look over a hand I played in a $365 bounty event from when the WSOP Circuit was in my backyard at Horseshoe Council Bluffs. At the point this hand arose, it was deep in the tournament and I had a lot of chips and a very aggressive image. I believe there were around 25 players left with 18 due to get paid. My read on my opponent in this hand is that he's a fairly tight player who will give up to significant pressure if he has a mediocre holding. At 1,000/2,000/300, I opened to 4,600 under the gun with . Action folded to the big blind, who called. The flop came and the big blind checked. I bet 3,800 and he called. The turn was the . He checked again and I bet again for 8,500. He once again called. On the river, he checked a final time. I barreled 11,500 and he quickly called. I turned over my king-high bluff and lost at showdown to . A little before this hand began, I was probably the tournament chip leader with four tables left in the event. I wound up not even cashing, having to content myself with a few bounties I collected along the way to break even. Obviously, it was a disappointing finish, and this was one of the hands that started my slide. To start things off, I was opening a lot of hands and not running into too much resistance, as is often the case in these things, so opening king-jack here is something I'd do almost always. The big blind defends and it's so far, so good as I felt I was in a profitable spot. The ace-high board is one I'll continuation bet with most of my holdings, and when called, I expect I'd be up against flopped top or middle pair in many cases with a chance of facing a draw as well. On the turn, another flush draw arrives. I fired again, about half-pot, as I would if I held a strong ace on this possibility-filled texture and once again was met with a call. The river brings a total brick short of him holding something like . He checks again and I have to decide whether to three-barrel. I felt going in that it would take three barrels to get him to let go of a queen. I did not expect it was likely he'd fold an ace, but I also felt he'd possibly be three-betting good aces given how aggressively I'd been playing. So, I somewhat discounted those and thought his most likely hand was a pair of queens. I figured if I made a smaller but still sizable bet it would look like an ace going for some final river value. On the other hand, as we learn more about blockers, we know that hands like here block many of the likely holdings. Having no spades in my hand also means it's slightly more likely he had spades, and I can beat many of those hands at showdown. Then again, if he backed into a weak pair — say, — I'd like to bet to get those hands to fold. Overall, it's a tough call whether to barrel this one off, but given my read that he likely had a queen and could possibly lay it down, I went for it. Unfortunately, in the actual hand, he had made a disguised two pair after turning a flush draw, and I was probably never winning this pot. I wound up busting a short time later and was left wondering if I should have saved a few chips in this pot.